And what is a qua qua, anyway? The Mount Qua Qua hike extends for 3 miles, taking between 2-1/2 and 3 hours, round trip. This can be a very slippery trail after rain. Trailhead: From the park headquarters, walk for a few hundreds yards on the paved road leading to St. George's. A sign on the right marks the start. The hike to Mount Qua Qua passes through true rain forest territory which is apt to live up to its name suddenly, so bring a windbreaker for showers and the cool trade winds. Also take water and snacks for a break at the summit. This is a challenging hike leading to the rocky summit of Mount Qua Qua and its famous view of the northeast coast. At various points there are also some good panoramas of distant Grand Etang. This is an excellent hike for photography but keep your camera in a backpack or holster; you need both hands for scrambling up and grabbing tree roots. You'll experience little gradient until you pass a junction sign leading to the Grand Etang trail to the right. From this point the trail keeps going up and down, sometimes quite steeply, and the red clay soil along the crater rim is icy-slick when wet. In some places, the slippery trail is only a few feet wide: dramatic drop-offs on either side demand caution. As troublesome as this wet clay may be, early settlers found it ideal for chinking their wood and bamboo dwellings. As you start to climb, the plants and trees on the lake slope take on the characteristics of elfin woodland, forest that's been stunted and sculpted by the ever-constant trade winds. 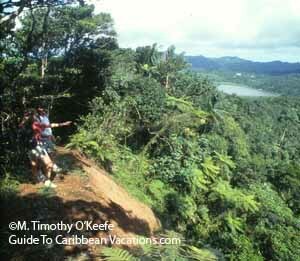 In fact, on windward slopes all throughout Grenada you'll see similar formations where the trades have dwarfed, twisted and folded back the vegetation. It's more pronounced the higher you go. Interpretive "Q" signs mark several places. Q1 is a vantage point to appreciate how the foliage overlooking the lakes have been sculpted and stunted by constant high winds to form the fairy-like elfin woodland. Q2 is a large bui tree (Micropholis chrysophyuoides) blown over in 1955 by Hurricane Janet; its huge roots make good shelter from the rain. Q3 identifies many mosses overhanging the trail. Forest workers use the moss, which is almost always damp, to wrap around newly grafted tree branches to speed healing.